Our peach barbecue sauce is a little sweet, a little smoky, and has a lot of flavor. It’s perfect for Labor Day or a quick late-summer dinner. Easy to make ahead of time, the chicken can be cooked either in the oven, on a barbecue grill, or sous-vide. The final components, sauce and slaw, come together in minutes. Salt and pepper both sides of the chicken breasts. Roast in the oven at 350 degrees, on a BBQ grill, or Sous-vide until the internal temperature of the center of the breasts reaches 165 degrees. Remove and rest for 15 minutes. Then using 2 forks, shred the chicken. Place the chicken in a large bowl and keep warm. Place the thawed peaches in a blender or food processor with 1/4 cup of water. Process until very smooth. To a medium saucepan, add the peaches and the rest of the ingredients, whisking to combine. Set over medium heat and simmer for about 15 minutes, keep warm. In a large bowl, mix the 1 cup of barbecue sauce with the shredded chicken tossing to coat evenly. Add more if needed until the chicken is well coated; keep warm. Cut the buns in half. Heat a large sauté pan over medium heat. Spread the softened butter evenly over the cut side of the brioche buns. Place the buns, butter side down, in the sauté pan and toast until nicely browned. 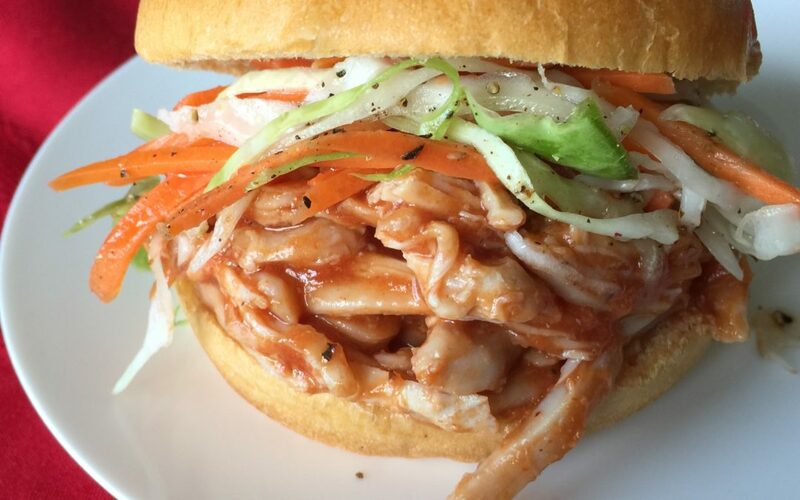 To assemble: Place about 1 cup of bbq chicken on the bottom bun, top with 1/4 cup of slaw and cover with the top bun. Serve warm. Quick Slaw– In a small bowl, whisk together 2 tablespoons white vinegar, 1 tablespoon honey and 1/4 cup olive oil; set aside. In a separate bowl mix together 3/4 cup shredded cabbage, 1/4 cup shredded carrots, 1/4 cup thinly sliced green onions and 1/4 teaspoon of fresh ground black pepper. Pour the dressing on the cabbage mixture and mix together until combined.